Lately I’ve been yapping about other peoples’ mistakes. Time to turn the focus on myself. I’m no stranger to dumb purchases now and then. This post is about one of them. Yes, it’s true. I just ordered a drone. Don’t worry; it’s not one of those that governments deploy to covertly zap their enemies. It’s a Parrot AR Drone and I feel a bit ridiculous for purchasing this thing. More on that in a moment. Shaun the Sheep lanyard and wallet: What am I, 7 years old? Perhaps mentally. Caramel apple: It was marked down and my empty stomach got the better of me. Ford EXP: This was my first car and what a smelly pile of junk it was. Various Internet bubble stocks: Bye-bye hard earned money. Programmable LED Christmas lights at Costco: These things are awesome, but they also set me back $60. I have regretted all of these purchases. Add a drone as the latest ridiculous purchase. I’ve been eyeballing these things for a long time, but so far, have resisted the temptation. After spending a couple mindless minutes on YouTube watching drone videos, I gave in. Perhaps I’ll put some green lights on it. I’ll then fly it around at night and whip up some UFO rumors in my little town. The drone has a camera on it. I’ll be able to take some killer aerial pictures and movies (I wish I had it during the recent floods). How will my neighbor’s ultra-yappy, annoying-as-all-hell Schnauzers react to my new toy? Only one way to find out! Ever since I made up my mind to go down the path of early retirement, I’ve trained my brain to resist buying stuff I don’t really need. For the most part, I’ve succeeded. I’m no longer tempted by the shelves of Costco. I don’t go to Amazon unless there is something I specifically need. I don’t need to upgrade my phone every 2 years, so I don’t (go iPhone 4!). For the most part, it works. My one weakness is gadgets/geeky stuff. I’ve always been this way. 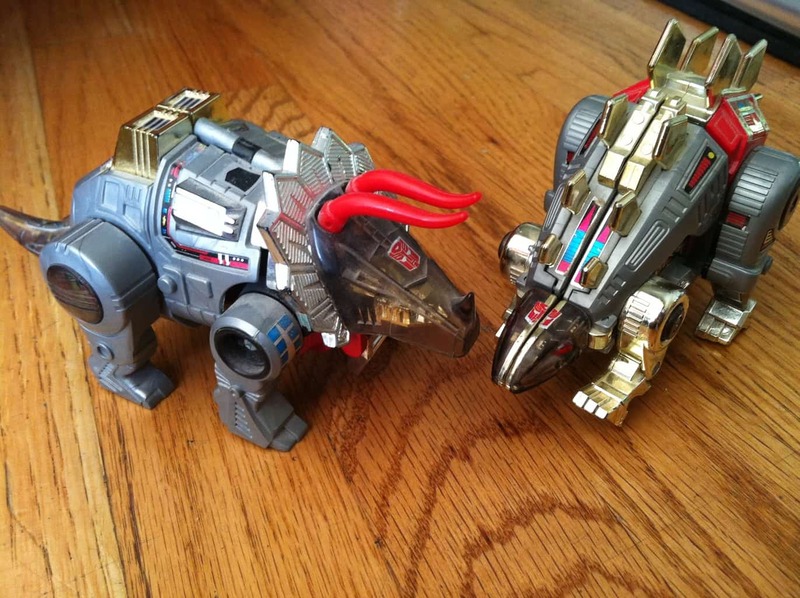 I still have my Dinobot Transformers* from when I was a kid (Mrs. 1500 note: And he says I am a hoarder…). When I’m not reading personal finance blogs, I’m reading the tech news. While I’m swinging a hammer on my home, I listen to tech podcasts (Mrs. 1500 note: Much to my chagrin, as I truly don’t care about technology.) (Mr. 1500 response: Hmmm, I wonder how Mrs. 1500 thinks I educate myself about those tech stocks I buy that have pushed our portfolio to dizzying heights?). I‘m pretty much obsessed with technology; especially when it makes our lives better. I’m not sure that the drone is going to improve my life much and it just zapped $300 from my wallet. (Mrs. 1500 note: $300?!? Honey, we need to talk…) I could have fed my family for a month on that. I could have paid my annual car insurance premium. I could have given the money to a worthy cause. How about you? Any crazy purchases lately? What do you do to prevent yourself from buying drones, BMWs, sheep related merchandise, etc.? *I was about 10 when the Dinobots came out and I thought they were the coolest things ever. However, if you think about it, the whole concept is ridiculous. The whole point of the Transformers was that they could change into real-world objects to disguise themselves. Remember the theme song: “The Transformers! Robots in disguise!” If you want to hide from society, turning into a life size, robotic dinosaur is no way to do it. Dinobots clearly marked the time when the Transformers franchise sold out**. **I still love my Dinobots. I bought two huge couch seats and an ottoman two weeks ago at a garage sale. They are in great condition. Our apartment is cramped but hopefully, they will fit in our house. If not, I’m going to have to sell them on Craigslist. I need to stop making random purchases for our house! We don’t need more stuff! I think one reason why I feel comfortable is because we met our financial goals this year 4 months earlier than projected. So there’s no sense of urgency to save more, even though we should. So now, I need to set a new goal. New goal is maxing out our IRAs before the end of the year. The Mrs. and I love garage sales and thrift stores! For some reason, our thift stores will have new merchandise there often. I got a stack of workout shirts made out of some fancy wicking fabric last year for super cheap. They still had the tags on them! I had the Stegosaurus Dinobot and that picture brought back memories. I agree that they were totally illogical since transforming into dinosaurs is, if anything, more suspicious than a huge talking robot. But the Dinobots were always loose canons – why hide from dumb, puny humans? Optimus tried to get them on board, but he could not wrangle their wild spirits. They were agents for good, but also, chaos. I think our best tool to keep these under wrap is an itemized (and probably too-granular) budget. We are not logical enough to use MMM’s strategy of simply refusing any sub-optimal purchase sans budget in true stoic fashion: so we limit our bad purchases by capping them within certain categories. Crap…I didn’t count on the solidarity of women when I stupidly wrote that comment. DbF, holy cow, you have one heck of a memory! I actually didn’t watch the cartoon much. I was just fascinated with the toys themselves. Some of the designs of the way the switched back and forth was really incredible. Even as a kid, I always wondered how they came up with it. If you like Apple stuff, wait until that one shows up. It may be a while yet, but I’ll bet they get it right. You’ve got a good nest-egg saved up, so I guess you are more free to make spendy purchases like this if you would like. I also hope your drone works better than the cheap mall-helicopter toy I got for Christmas a few years back. After about 11 charges it would no longer work at all. I do know that MMM wouldn’t be impressed, though. If I were you I would be concerned about his famous face-punch. I think about all the home building and pull-ups that guy does – that alone keeps me away from most of my spendy purchases. Yeah, I’m all for face punching myself over this one. Maybe I’ll let the drone attack me? An important inquiry: Can the drone carry a pint, a six pack, perhaps a cooler? If it could be used to deliver beer without interrupting a game of darts, then I am all for it no matter the cost. I am not tempted by gadgets, but good craft beer is irresistible! Well, anyone can plainly see that your money was well spent. Case closed, 1500! So the sheep lanyard was for you, Mr. 1500? Non-judging (maybe), just very curious… my friend had this remote controlled beer cooler thing with wheels that would go from table to table at a baby shower. I’ve been tempted to buy it since it’s so cool, but that would mean that I would have to 1) entertain guests and 2) clean, so it’s been on the backburner. I was more of a Voltron girl versus Transformers, though I love Bumblebee. I vaguely remember Dinobots, oh the memories! Remote controlled beer cooler? Now that sounds awesome! Haha awesome purchase. I think that it’ll be really really cool. $300 is a lot, but if you have the money then it’s not so bad. I mean, it’s not like it’s an insane amount of money. You’ll have to do a follow up post about how it works with some photos and videos taken by it. I’m interested! You are right next to me in Utah. If you ever pass through my neck of the woods, you can pilot my drone anytime! Dude, that’s awesome! Think of all the amazing things you could build. Sure it’s pretty expensive, but if we don’t use our money to buy toys once in a great whole, what is it for. There are so many possibilities! I’m frugal just like most PF bloggers, but holy heck is they cool. Yeah, I can’t wait until it shows up. The best part may be the camera. Did you see the pictures people take with this thing? I don’t have a weakness for any kind of tech gadget but I do have a soft spot for video games. I never really grew out of that childhood time spent with the Mario brothers, lol. With that said, I have no idea how you like Snowballs. Much like Ho-Hos, Twinkies, Moon Pies, etc, I just feel like I need a dental cleaning after eating one so I avoid them. Micro recently posted…Amazon Prime Review – Are the benefits worth the price? Oh wow, I loved video games as a kid. I love Super Mario Brothers and Metroid especially. It doesn’t stop there for me. I feel like I need to drink a can of Drano to cleanse my insides. Snowballs are a very rare treat. Maybe 2x year. Thanks! I never really new these existed until I found your blog. I was doing great keeping my “wants” to bicycle related purchases (because I live in Amsterdam and have several bicycles). But after finding a youtube video of your Parot Drone flying over Amsterdam…now I want one too! I guess like MMM and other say, if you dont go “looking” for things to buy it is easier to be vigilant. Looking forward to seeing your cool videos. The drone will likely be more satisfying that watching an internet stock (or shale gas stock in my world) go from $300 to zero. I have a couple bikes myself. While I drool over some of the new, super lightweight, carbon road bikes, I have so far resisted temptation. $300 to 0. Whoah. Not fun. I’ve been counting up how much money I spent on stuff that I ultimately decided to get rid of. The total is on my blog, and it’s come out to over $2,000 (and I’m not done yet!) I wish I’d invested the money, or used it to pay off my student loan. Great post. Most people don’t realize how much useless crap we waste money on! haha, Mr PoP would want to play with the drone with you. We had an elephant gift exchange for his office this last Christmas and we bought a remote control helicopter that you could make display light up messages… he arranged the entire elephant gift exchange so he could go home with the remote control toy. =) It was then flown around the office during the week between Christmas and New Years when all the sales people don’t want to be (but have to be) at work. I think we’ve all got weaknesses like this, it’s just a matter of if we know ourselves well enough to recognize them as such or if we’re fooling ourselves by claiming everything is an absolute necessity and nothing more. Will they throw us out of FinCon if the drone makes an appearance? Don’t underestimate my stupidity! Yep. It’s actually an internal battle for me. I read MMM’s posts and he seems to have cleansed himself of all wants. I’m just not at that point yet. I may never be at the point. I really do fight with it all the time. Am I wrong for wanting a motorcycle? Maybe. The deal I’ve made with myself is no big toys (> $1000) until my retirement is set. Oh the stupid purchases! I have a little fancy for kitchen gadgets and “as seen on tv” and infomercial stuff. I know it’s crap but I am obviously easily impressed. I had “the Gazelle” exercise thingy by Tony Little, really a 2:00 am purchase. Eventually it made its way to the back porch and rusted. At the fair I always buy something to help me slice my veggies in a fantastically short amount of time but I always just use a regular knife. My list is extensive and I don’t have anything to show for it as they all get thrown away or donated at some point!!! Have fun with the drone!!! Love your blog! Can you please look into buying one of these next? It would eat your drone for lunch! Whoah, that thing is badass! I could definitely have fun with that!